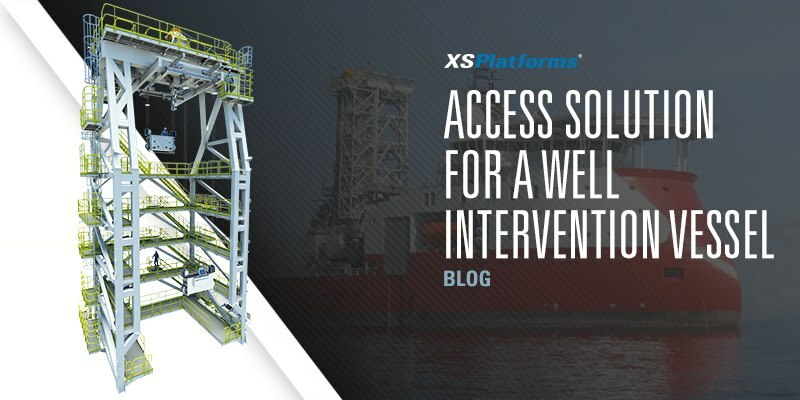 XSPlatforms was asked to provide an access solution for the maintenance tower of a well intervention vessel. This vessel is supplied with a special tower for Blowout Preventor (BOP) maintenance and storage. 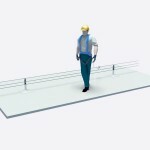 With our access solution in place, all parts/facades of a BOP can be reached by workers during the maintenance period. Without any specific requirements from the client, we set out to work on the best solution for performance at open sea. Blowout Preventors (BOPs) are large safety mechanisms for oil rigs that should prevent disaster in case of a blowout; an uncontrolled release of oil*. Because BOPs are important not only to the safety of the site and workers on site, but also to the environment, they need to be maintained and tested at regular intervals. However, BOPs come in a diversity of shapes and sizes. Some areas are be hard to reach when standing on the maintenance tower when a smaller BOP is in for upkeep. Previously workers used a personal fall protection measure, such as a harness and safety line, to climb the BOP in order to get to the hard to reach spots. A change in legislation and rules by local authorities no longer allows this method. 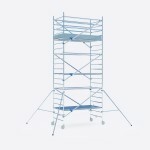 So the client was looking for a solution to reach problematic areas in a safe way and in accordance with legislation. * With the oil disaster in 2012 in the Gulf of Mexico as an example. The first challenge we ran into with this project was the time frame. The maintenance tower was almost fully assembled, the vessel was launched and a final delivery date was set. All was ready for operations, except for the access solution. We had 8-12 weeks to complete the solution, including time for design, manufacturing, installation, testing and on site commissioning. While working on the solution we ran into a second challenge; offshore rules and regulations. The intended solution didn’t fit any of the required standards. We called in the assistance of DNV GL, a quality assurance and risk management company for maritime and oil & gas industries. They helped us find a solution that fell within all the relevant standards. Thirdly the maritime climate posed a challenge. All aluminum and steel had to be galvanized (extra) and all electricity had to be installed in accordance with the IP67 (extra dust and watertight) standard. 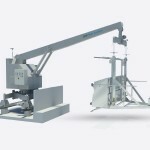 We developed a custom suspended access solution for the BOP maintenance tower with two self-hoisting gondolas with XSClimber hoist-units. One at the front and one at the rear of the maintenance tower (port and starboard sides of the vessel). 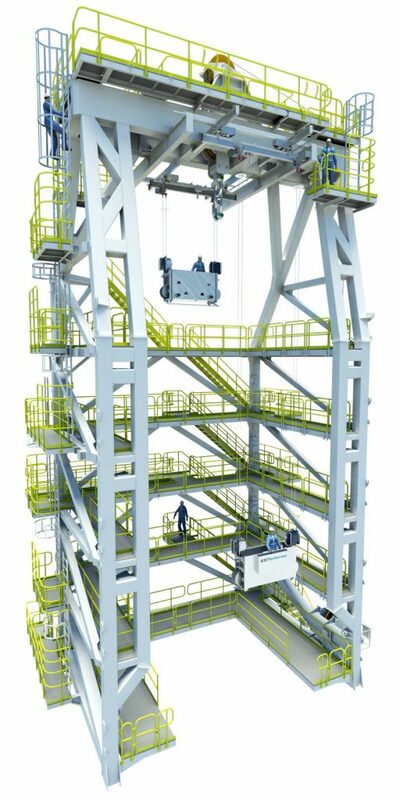 Several tie-back points have been integrated in the structure of the maintenance tower so that the gondola is secured in at least 3 points at all times; 2 on the maintenance tower and 1 on the BOP. 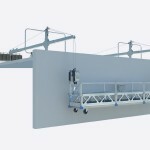 We’ve put a system in place with double trolleys, to ensure that the gondola can move in all directions and thus has maximum reach around the BOP. The anchor points and the gondolas have been made suitable for operation on open sea. 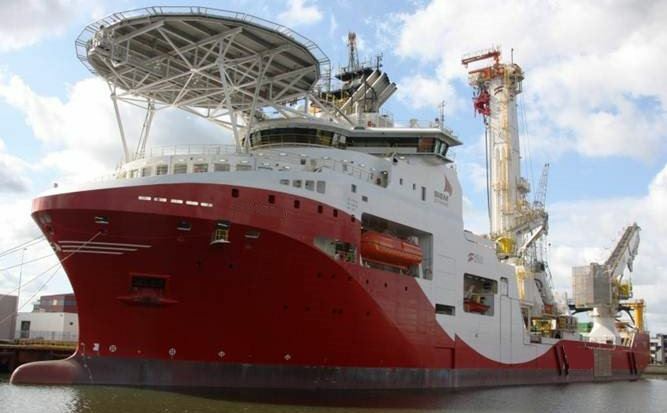 We are proud to have been chosen as supplier for an access solution on such an impressive vessel. Next to the fact that this was a unique challenge for a safe work solution to be used while out on the open sea, it is, as far as we know, the only one of its kind. For more information about the project, download our informational leaflet by clicking the button below.